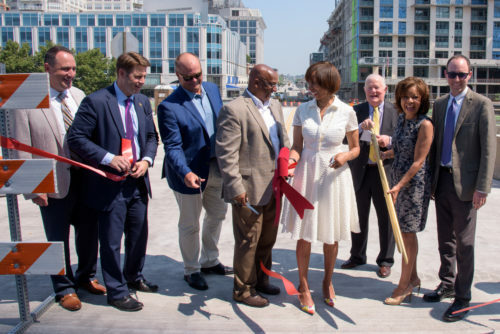 JMT, along with Baltimore City officials, recently celebrated the partial opening of the Central Avenue Bridge – the City’s first design-build project. As lead engineer, JMT designed more than one-half mile of streetscape/roadway improvements for a busy section of Baltimore that has seen recent development. Our work included eight intersections, storm drains, traffic signals, street and under bridge lighting, six new signalized intersections, electrical duct bank replacement, water and sewer replacement and lining, structural culvert repairs and replacements, bridge repairs, incorporation parking, bump outs, bike lanes, public relations, landscape architecture, and safety improvements. JMT also assisted with substantial environmental services due to the presence of groundwater and soil contamination in the corridor. The new Central Avenue Bridge better connects the Harbor East neighborhood to the south end of Downtown Baltimore that was only reachable by an already-busy street. It will also create access to the planned Harbor Point development site. The entire project is expected to be complete by the end of September 2018.